About this Value Monthly Pocket Planner - Good Value Calendars(R):A spacious, vertical monthly grid for a great value2020 Calendar.2020 is included as standard copy on the front cover.Ten cover colors to choose from.Pages: 16 sheets (32 pages).Top markets: financial, retail, manufacturing. About this American Splendor Pocket - Triumph(R) Calendars:Always popular, this handy calendar features 12 beautiful photographs and a convenient storage pocket each month. 2020 Calendar.Reverse collated for storing items all year.Top markets: insurance, financial, retail. About this Wildlife Art Pocket - Triumph(R) Calendars:This great pocket calendar, featuring outstanding artwork from top wildlife artists, will be a popular choice for sporting goods stores and financial institutions, along w/ many other businesses and organizations.2020 Calendar.Reverse collated for storing items all year.Top markets: retail, construction, financial. About this Beautiful America Pocket - Triumph(R) Calendars:This popular, affordable scenic pocket calendar is ideal for any advertising message. The full-color photographs and handy pocket make a useful, appreciated combination. 2020 Calendar.Reverse collated for storing items all year.Top markets: insurance, retail, financial. About this The Saturday Evening Post Pocket - Triumph(R) Calendars:The Saturday Evening Post Illustrations by Norman Rockwell - Handi Pocket.This pocket calendar stands out, thanks to incomparable art from an American legend.The pocket feature adds to the value and usefulness of this lovely calendar. 2020 Calendar.Reverse collated for storing items all year.Top markets: financial, health care, insurance. About this Single Pocket - Triumph(R) Calendars:Great value and great versatility! This calendar folds for convenient distribution as a self-mailer and stores easily in a filing cabinet when the year is over.The single pocket is ideal for bills and memos.2020 Calendar. "Season's Greetings" on outside front cover.Outside back cover is for self-mailing.Top markets: manufacturing, retail, utilities. About this Econo Pocket:Handy pockets for each month of the year help keep you organized. 2020 Calendar. Includes almanac information. Large monthly pockets fit 8-1/2" x 11" sheets. Customize with your image on inside front cover. Top markets: financial, insurance, agriculture.Material: 60# offset/10 pt cover. 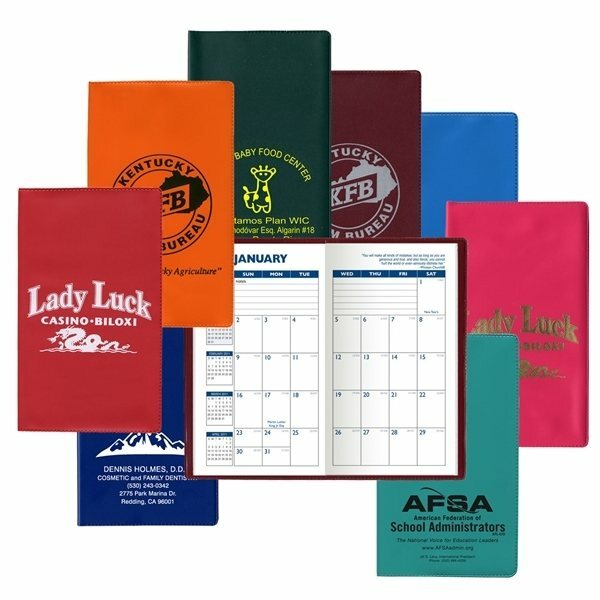 About this Wallet Calendar - Paper Products:12 month flat calendar, digitally printed in full color.An ideal promotional product that will enjoy almost daily usage.Material :12 pt. high density white paper board. About this Barcelona - Two - Tone Soft Vinyl Cover Monthly Planner:This "Barcelona" Two-Tone Vinyl Soft Cover Monthly Planner features a 32 page insert that shows one Month on a two-page spread. The planner inside is printed in blue and runs 14 months from December through January. It includes pages for important phone numbers and dates as well as advance planning areas. Also included are metric conversion charts, a time zone map, area code table as well as an important holidays page. The Standard Vinyl Monthly Pocket Planner is great to plan monthly events. Your planner will give you all the dates you need to schedule your next event. Don’t let this great promotional calendar slip by! It’s popular feature includes a time zone map. This Standard Monthly planner features 32 pages and shows one Month on a two page spread. Available in red, navy blue, green, black, brown, grey, white, med blue, orange, purple, yellow, bone, royal blue, teal, pink, gold, and silver. Much like the Standard Vinyl Monthly Pocket Planner, this planner does not include the map. It is still a top seller, and as you can see, both planners are listed as a top seller in pocket calendars. 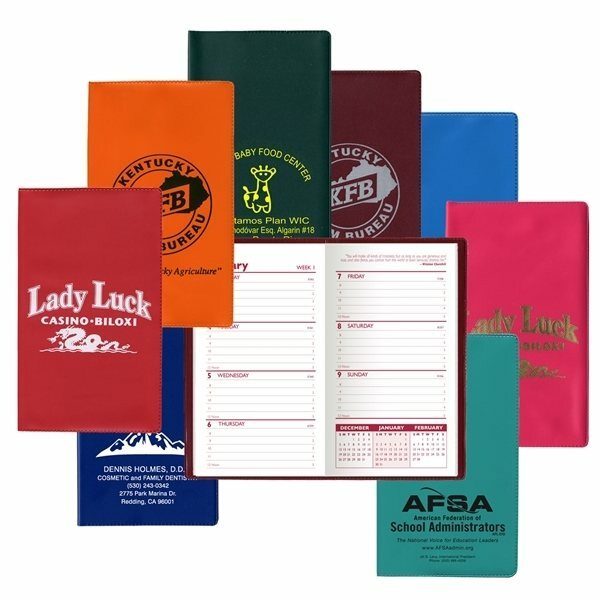 Don’t miss out on our promotional planners. The Standard Weekly Pocket Planner Without Map is great for any event! Let your customers plan their upcoming events with this organizational tool. This standard vinyl Weekly planner features a Week at a view format in a one color print. It includes a pages for important phone numbers and dates, popular 800#s and expense record. Also included is an area for advance planning, metric conversion chart, time zone/area code map and an important holidays page. Available in red, navy blue, green, black, brown, maroon, grey, white, med blue, orange, purple, yellow, bone, royal blue, teal, pink, gold, and silver. Note: This Planner does not have a map in the back. Would you like to add more details for each day? Well this is the calendar for you! This top calendar allows you to write more information for one day, but still allowing it to be a pocket calendar. It’s a top seller because customers love to use this custom calendar on a daily basis. Don’t let this one slip! This "Barcelona" Soft Cover Two Tone planner features a 128 page weekly insert that shows one week on a two-page spread. The planner inside is printed in one color and runs 12 months from January through December. Note: This planner DOES NOT come with a color map. With a wide selection of pocket calendars available in our selection, you’ll be able to keep track of all your important dates. We have monthly calendars, credit card size calendars, weekly calendars, health guide calendar, and more! Our custom portable calendars are great for everyone who wants to keep track of days. Pocket calendars are great for any customer. They are convenient to schedule important meetings, tasks, events, and dates. You will never want to go anywhere without your pocket calendar. Make your customer’s life more organized with our promotional pocket calendar. Use mini calendars to promote your next event, and allow your customers to save the date. Your customers will love to be reminded! Look through our selection of pocket calendars. Shop here! At AnyPromo, we place a high standard on brand impact, just like our customers. Search our site for a wide selection of promotional pocket calendars and see for yourself. Trade show and event guests are bombarded with boring branded swag at every opportunity, so it is extremely important to stand out. Our custom mini calendars are specially priced and proven to generate impressions. 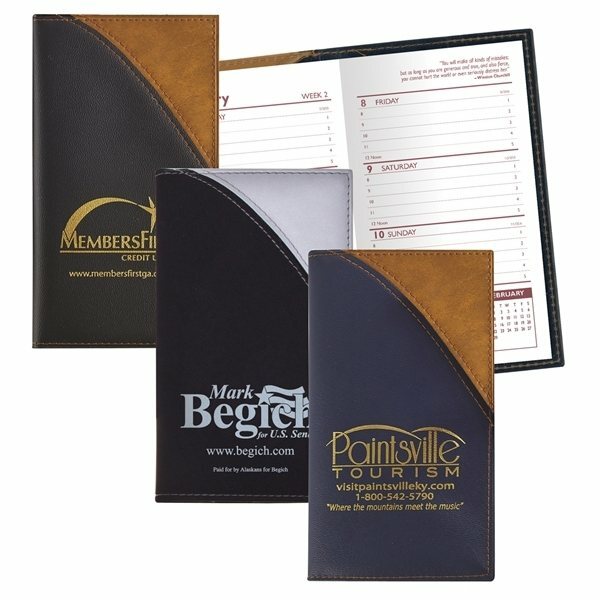 Click through our inventory of promotional pocket calendars on sale now. Here is a snapshot of our selection of 35 custom pocket calendar options. We’re ready to help expedite your order, so give us a call! Grab your promo pocket calendar swag today! These calendars are great for offices, schools, and trade shows. Whether you want your employees or students to stay organized, our pocket calendars will do the job! Exhibiting at a trade show? You can always remind your customers about your next event with a pocket calendar. Calendars are great to promote important dates. Let your event stand out from the rest! Our featured list of pocket calendars are for everyone. We have different styles available, from monthly to weekly versions. If you want to be more descriptive in your pocket calendars, we have those available too!